For the Yu-Gi-Oh! Dungeon Dice Monsters set, see Dungeon Dice Monsters: Booster 7. 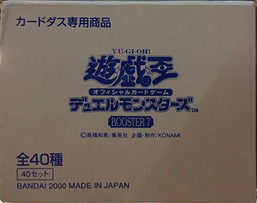 Booster 7 is a Japanese Booster Pack in the Yu-Gi-Oh! Official Card Game that was released on March 1, 2000. This set was sold only in Carddass vending machines. It is the last set in the Booster series. Of the 40 cards in Booster 7, all but 5—"Ancient Sorcerer", "Beautiful Beast Trainer", "Grappler", "Job-Change Mirror" and "Night Lizard"—have since been printed in the Yu-Gi-Oh! Trading Card Game. This page was last edited on 18 May 2017, at 03:16.